Click n' Collect. Save £13. 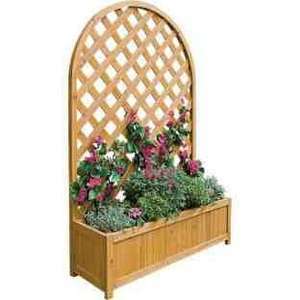 Suitable for outdoor use, this Large Lattice Garden Planter is ideal for decorating garden walls. Easy to assemble, it is weather resistant and is weighted for stability. Bought this full price earlier this year. Had lots of compliments, thought it was a bargain now. Would go and buy another but had a bit of a struggle fitting it in the car! Bought this full price earlier this year. Had lots of compliments, … Bought this full price earlier this year. Had lots of compliments, thought it was a bargain now. Would go and buy another but had a bit of a struggle fitting it in the car! What is the quality like will it rot away in weeks? Wouldn't sealing it, or painting it keep it from rotting within a couple of years? brill- just what I'm after. was looking to buy these at the normal price! Wouldn't sealing it, or painting it keep it from rotting within a couple … Wouldn't sealing it, or painting it keep it from rotting within a couple of years? I've had mine for a good few years only just started to rot, worth it at sale price!! I think this is the same planter I brought cheap in Homebase about 3 years ago. The quality is OK. If you raise it above the ground with some bits of old brick or something similar, it helps keep the base from rotting if the ground is wet. Ok for the price, but doesn't last long - even if you do treat the wood with preservative. Wouldn't buy again, this year I invested in some decent tanalised wood and made my own which I reckon will last a LOT longer. Ok if you don't have the time or inclination to make your own! Thanks for info, so protection may not actually expand this things life too much, gotcha. I think some may be getting confused between wood preservative and wood treatment(s). Can you not treat wood with a preservative, and your point is?